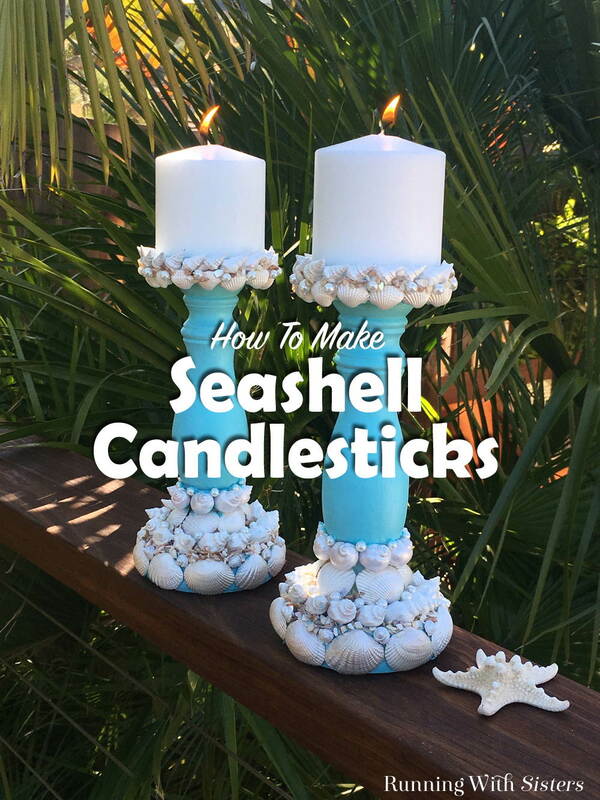 We love seashell crafts, so of course we had to make seashell candlesticks! 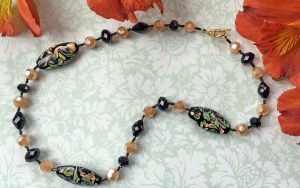 One of our favorite tricks with seashell crafts is to paint the seashells with Mother Of Pearl. That way you can use all the shells you find (or buy) without worrying about color variations. And once they are all pearlescent, the shapes and swirls of each shell really show. 1. Paint all of the shells Mother Of Pearl and set aside to dry. Apply a second coat of paint if needed. 2. Apply a coat of Gesso primer to the candlestick and let dry. Paint the candlestick Aquarium. Let dry. 3. To decorate the base of the candlestick, glue a row of large cockle shells around the base of the candleholder with the Quick Grip so they are facing upward. Hold each shell in place until the glue sets up. Glue a small, spiral-shaped shell in the gaps between the tops of the shells. Then glue a row of medium cone-shaped shells around the base so the points are facing out. Glue a pearl in between each shell. 4. To decorate the stem of the candlestick just above the base, arrange and glue the medium cockle shells so they are facing downward. Glue the shark’s-eye shells around the stem just above the cockles. Then glue a pearl between each shark’s eye. 5. For the top lip of the candlestick, glue a row of small cone-shaped shells so the points are facing out and so each shell looks like it’s resting on the next. Glue a row of small cockle shells beneath the cone shells so they are facing downward. Then glue a pearl between each small cockle. 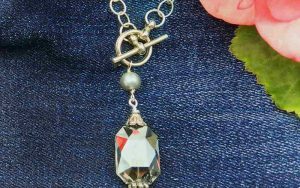 Here’s a video we made showing how to glue small items like rhinestones and pearls. We have a few tips for how to pick them up and place them using a waxy stick and even a piece of spaghetti! 6. Paint the areas between the shells around the top of the candlestick with watered-down Tacky Craft Glue, then sprinkle with crushed shells. Repeat to add crushed shells between the shells around the stem and base of the candlestick. 7. Place a pillar candle on top and admire your shelled masterpiece! 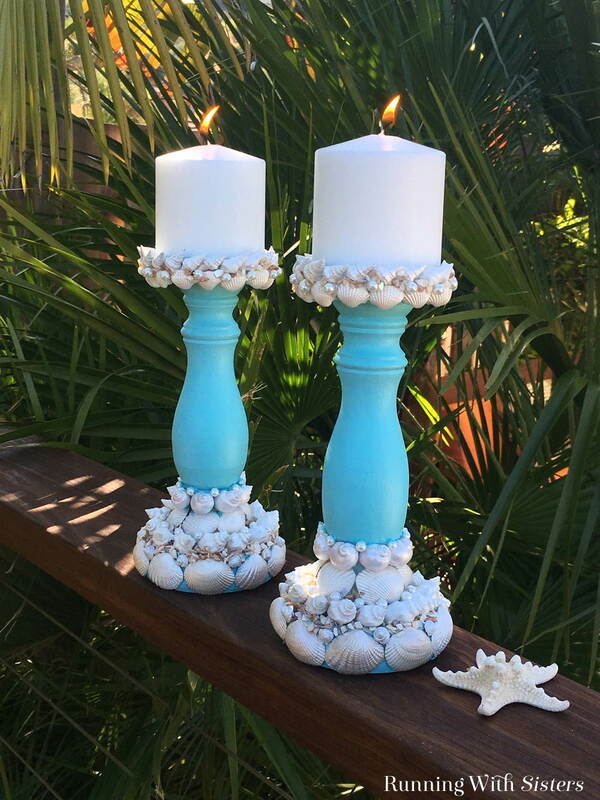 Didn’t these seashell candlesticks turn out lovely?! What should we shell next? 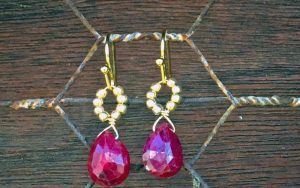 i really loved this craft project, plus your how to video on glueing beads and rhinestones. your poor mans ideas for products was really cute! 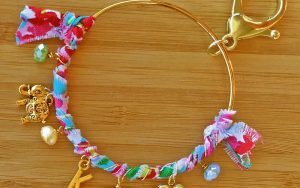 i live by the gulf shores, so i get a lot of shells, and different ideas as to ways of using them is great! keep up the good work, thank you for sharing. i really hate crafters who wont share an idea. very selfish and that “crafteyer then thou” attitude really makes me sick. i have a booth in an antique mall so i get to see many great ideas. i would really like to sell my different items, but if some one asks me a question about how some thing was made i will talk with them about it. i really hate other dealers who wont share any advice about how to fix things etc… we need more gals like you around! happy 4’th of july to you both, and your familys! Thanks Merri! We totally agree, ideas are for sharing! 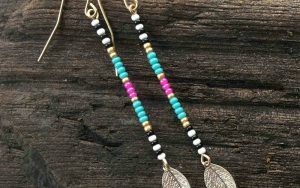 It’s all for the love of crafting. Happy Fourth to you and yours!